« Homepage / Gourmet / "French Flavors: What’s Old is New Again"
Since opening in September, Patois has become one of New Orleans’ hottest new restaurants. 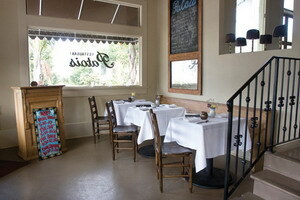 Housed in a century-old building that has seen many incarnations, most recently Nardo’s, an Italian eatery, Patois serves French bistro cuisine and Louisiana fare with a heavy emphasis of fresh local produce. “My partner’s grandfather is 103 years old. He spoke in patois. 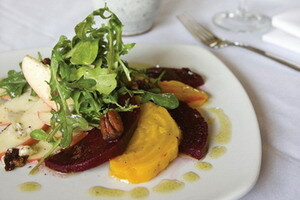 It kind of matches the cuisine,” explains Chef Aaron Burgau, who owns the restaurant with Leon Touzet III. A native of New Orleans, Chef Burgau has worked for some of the city’s finest chefs, including Susan Spicer at Bayona’s, and Gerard Maras at Ralph’s on the Park, where Burgau was Executive Sous Chef. He also did a stint at the chic little Lilette, and became Executive Chef at Bank Café. 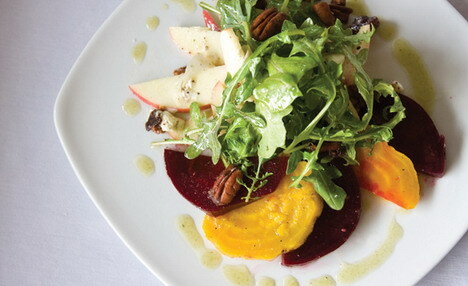 Touzet comes from a long line of restaurateurs, including the owners of Galatoire’s. His maternal great, great grandfather, Justin Lacoste, came to America in 1905 from Pau, France. He joined his uncle, Jean Galatoire, at Galatoire’s (Lacoste’s mother was Jean’s sister, Josephine Galatoire). Shortly afterwards, Lacoste opened his own restaurant on Chartres Street and also started the Vieux Carré restaurant. Touzat was always around restaurants while growing up (his father was a chef at Louis XVI under Daniel Bonnot), and he began working at Chef Bonnot’s Restaurant de la Tour Eiffel when he was just 14 years old. While being a restaurateur comes naturally to Touzat, Chef Burgau’s passion is in the kitchen, producing dishes with ingredients gleaned from local farms. After serving as a chef for many years, he most recently worked at the Crescent City Farmer’s Market and got to know the vendors. “Our cuisine is pretty eclectic. Patois is slang for a little Spanish, a little Italian, but mainly I am classically French trained. I worked at the Farmer’s Market for the past eight months before opening Patois, so everything we have is fresh,” he says. One of Burgau’s mentors, Chef Gerard Maras, has had a farm for many years and grows beautiful produce and herbs. He also provides items for the St. James Cheese Company on Magazine Street, where many top restaurants obtain their finest cheeses, including Commander’s Palace. “I get a lot of beans like purple hulls and lima beans from Gerard. I also get some of my sprouts and my farm eggs from him. 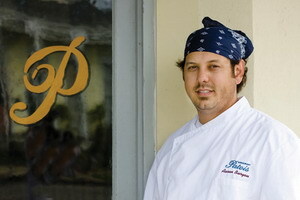 He comes in and helps me out in the kitchen sometimes,” Chef Burgau discloses. 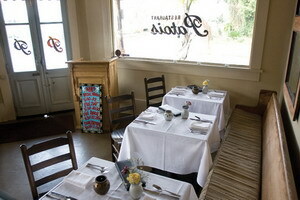 I have recently had some fine meals at Patois that recall evenings spent in Parisian bistros. Dinners have started with appetizers such as mussels steamed in their shells, engulfed in a smoky tomato broth, served with crispy French fries; sautéed sweetbreads, duck confit, hearty terrines, and cheese plates. Main courses have included panéed rabbit, hanger steak, and roasted duck breast, all classic French stuff. But the ambience at Patois is classic New Orleans. The acoustics on a busy evening remind me of Emeril’s or Galatoire’s on a Friday afternoon. You have to speak loudly to be heard by the person seated next to you. The tables are closely spaced; a tiny pot of flowers and small candles decorate the four-tops. Hardwood floors, ceiling fans, sparse mirrors and mantels line the two narrow dining rooms that echo with lively conversation. There is also a bar where people meet, greet, and wait for tables. Parking is a challenge on busy evenings, as Patois is situated in a highly populated residential neighborhood with narrow streets. One evening, we began with the oysters gratinée served in a petite casserole, topped generously with grated cheese, and served with three slices of toasted baguettes (it was like a rich dip). The fried chicken livers were succulent, mildly seasoned and served on toast points with a side of salad. The escargots and oxtail soup was deeply flavored with a musky accent, anchored by a wine reduction and served atop brioche; oxtail consommé is a classic French dish (Chef Burgau tells me that if you want to make such a soup, a good place to pick up fresh ox tails is at Wal-Mart, while Martin’s Wine Cellar has the canned escargots). One evening, pungent fried sardines came with Serrano ham and cured olives, and we also enjoyed the cheese plate which included a creamy goat cheese and a nice wedge of sharp cheddar, served with cured olives that quickly disappeared. It was very satisfying and reminiscent of meals I enjoyed in the south of France on cool spring evenings under a yellow moon. There are some nice salads I have sampled, including the Lyon salad designed with frisee lettuce, smoked bacon, fresh croutons, and a fried farm egg, finished with sherry vinaigrette. The heirloom salad with a Fascalini cheddar cheese and radish butter toast and a local honey vinaigrette is also a good choice, but even though I don’t normally care for beets, the show-stopper here is roasted beet salad with Pink Lady apples, goat cheese (my favorite), spiced pecans and a honey thyme vinaigrette (see recipe at the end of this article). The desserts are top notch. Aside from the cheese plate with currant and apple compote (I am a passionate cheese aficionado and love anything from the St. James Cheese Company), I would recommend the tantalizing hazelnut meringue layered with coffee butter cream and chocolate ganache; the house made sorbets, especially the Gray Goose and grapefruit; the rugelach served with a butter pecan ice cream; and the chocolate plate with handmade artisan chocolates. Finish the meal off with French press coffee or some strong espresso and you are on your way, feeling as though you have graced a sassy little bistro on rue St. Germaine. The staff at Patois is quite friendly and accommodating. Attire is casual. Here you can write a comment to the post "French Flavors: What’s Old is New Again"